Software support for PyPortal is via CircuitPython. There is a great Integrated Development Environment (IDE) available in the form of Mu. 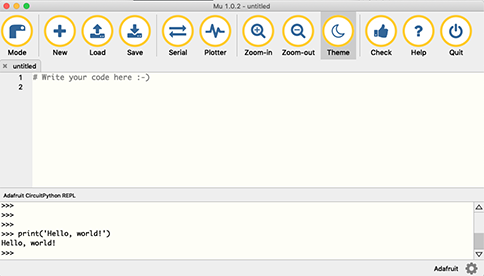 Mu is a simple Python editor that also has a built-in serial-port terminal. It allows command-line input of CircuitPython for instant programming, testing, and debugging. This feature is referred to as the REPL (Read-Evaluate-Print-Loop). Deployment of code to a PyPortal is immediate with Mu’s “Save” function. First follow the PyPortal setup instructions! 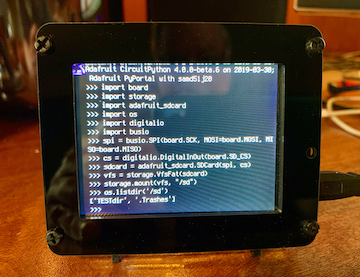 Update firmware to the latest version, install CicuitPython, and make sure you have installed the Adafruit CIrcuitPython Library Bundle. You should then have a “lib” folder at the root of the CIRCUITPY drive. Finally, insert a micro-SD Card formatted with the FAT or FAT32 filesystem. Press any key to enter the REPL. Use CTRL-D to reload. The “os.listdir()” line should show you files & directories on the CICUITPY drive. The “os.listdir(‘/sd’)” line should show any files or directories on the micro-SD Card. It may be empty if you have never written to the card or you may see something like “[‘.Trashes’]” as this is a hidden directory created on MacOS. You can also create a directory and check that it was created. For more information, check out the Adafruit CircuitPython API reference. For micro-SDCard mounting check out the storage module. For OS-type functions look at the os module. There is a nice write-up of file manipulation (read, write, delete, etc.) in the MicroPython docs. Please leave questions and feedback in the comments.